Need help opening RAR and ZIP files? 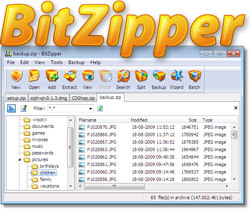 BitZipper is a data compression tool for Windows that enables you to open 47 different compression and encoding formats with superior ease-of-use. Read more below. New to data compression, ZIP and RAR files? A ZIP or RAR file is a collection of documents, movies, programs or other files that have been reduced in size (compressed) and stored together in a single archive file. To access the original files inside an archive file (to "unzip" or "extract" them), you need a tool like BitZipper. Want to learn more about compressed files? 001, 7Z, ACE, ARC, ARJ, BH, BZIP2, BZ2, CAB, CHM, CHW, CPIO, DEB, DMG, DOC, ENC, EXE, GZ, GZIP, HFS, HXS, ISO, JAR, LHA, LZH, LZMA, MSI, PPT, RAR, RPM, TAR, TBZ, TGZ, TXZ, UU, UUE, WAR, WinRAR, WIM, XAR, XXE, XLS, XZ, Z, ZIP, ZIPX, ZOO - with more to come! Think working with compressed files is hard? A visual step by step guide showing you how to open a RAR file and other compressed files is available here. It's really quite simple! Need more than just opening ZIP and RAR files? BitZipper will open almost any compressed file you will ever come across, but it does much more than that. When you open files with BitZipper, you can view the content directly from within BitZipper using a powerful built-in file viewer. It can view text files and almost any picture file format, including BMP, BW, CEL, CUT, DIB, EMF, EPS, FAX, GIF, ICB, ICO, JFIF, JPE, JPEG, JPG, PBM, PCC, PCD, PCX, PGM, PIC, PNG, PPD, PPM, PSD, PSP, RGB, RGBA, RLA, RLE, RPF, SCR, SGI, TGA, TIF, TIFF, VDA, VST, WIN and WMF. Encrypt your data and protect it from prying eyes. BitZipper supports strong AES encryption which is an encryption standard endorsed by the NSA. Enter a password when creating your ZIP file and BitZipper will apply strong encryption to your files and keep them safe. BitZipper comes with 4 interfaces, satisfying both new users and power users. It has a very friendly Wizard interface for new users, a Windows Explorer-style (Classic) interface for experts, a batch (bulk) processing interface for power downloaders and an interface accessible directly from Windows Explorer. Use Backup Sets (archive templates) to define which files and folders to back up, and activate your backup by the click of a button. Your backed up files can be accessed by BitZipper or any other tool capable of reading standard ZIP files. Working with compressed files should be no more difficult than working with your web browser or word processor. In BitZipper you will find handy features like multiple open archives, searching for files in archives and export of the archive content list to Word, Excel, text or HTML format - features you will not find in the average ZIP tool. Introducing support for the RAR5 format, improved 7Z, ISO, HFS handling and other minor improvements. Windows 8 support, improved DMG support, faster decompression of LZMA files, etc. ZIPX creation and extraction support. Powerful built-in file viewer that enables you to view almost any text, media and picture file format without the use of an external viewer application. "Your company's level of support service certainly outshines the rest of the field. Should our paths ever cross, I'll buy you an ale." "Your software can handle everything I have thrown at it. I heartily recommend BitZipper and give it 3 thumbs up over the competition for being extremely user friendly, secure & intuitive. Gotta love the Wizard!" "As a long time user of BitZipper, I hear other people complaining about their compression programs and I do not have any problems. I find your program the Best and easiest to use." "Just upgraded. THANKS for a great product. Seems like I use it every day. Used Winzip before. Find BitZipper to be better! Don't sell out to Corel!!" "I have been looking for a ZIP util that I like for several years, have used WinZip etc., this is the best I have used so far."